When Brendan Reilly’s Commodore plunges into the murky depths of a dam, he finds himself in dark waters indeed. He emerges a changed man caught between two worlds. In one world he is ‘Danny Boy’, respected long-time patch member of the Overlords motorcycle gang. In the other he is ‘Brendan’, scumbag ex-husband to Nicole and estranged father to Max. Brendan embarks on a dangerous journey of redemption, looking for a way out of the criminal life and back to his family. While he lays plans to leave quietly, the Overlords prepare for war against rival gang the Golden Jackals, and Brendan finds himself in deep. 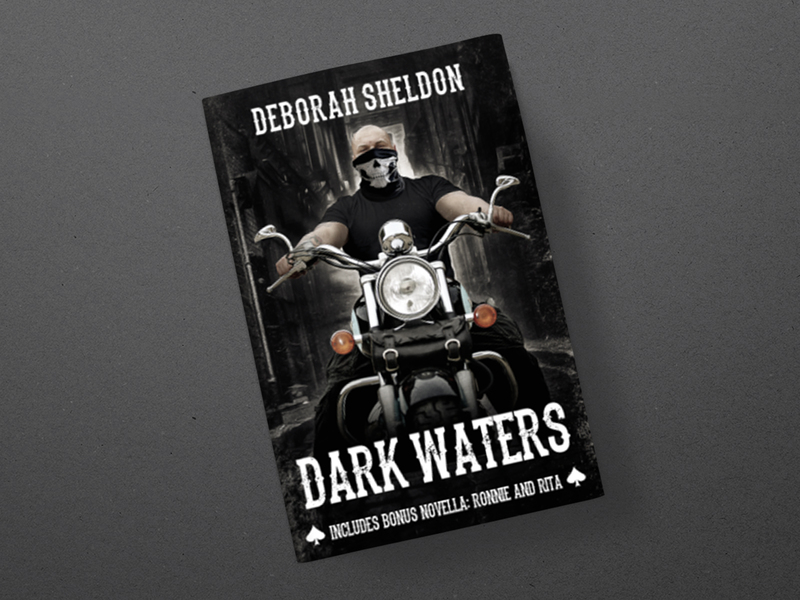 Dark Waters is a novella that skilfully thrusts the reader into the world of outlaw motorcycle gang culture. The writing is tight, the plotting is meticulous and the pace is relentless; but it’s the detail in this punchy piece that sets it apart. Every word is selected to make the reader feel something, whether it be physical (early on I was so caught up in Sheldon’s description of the sinking car that I found myself breathless) or emotional (the anxiety and alienation of rooting for a violent anti-hero). Deborah Sheldon’s assured handling of the language, hierarchy and power dynamics of the Overlords gives Dark Waters just the right amount of gritty realism without feeling contrived. She uses this to craft a dark and corrupt portrait of Melbourne, building a sense of foreboding and a crescendo that left me wanting a stiff drink and a lie down. Each character quietly nods to a noir archetype and then offers more: Nicole plays the ‘good-woman’, but she’s also tough and resourceful; Ellery is the villainous Vice-President of the Overlords, but he’s also compassionate. Published by Cohesion Press, Dark Waters also features a bonus novella, Ronnie and Rita. Ronnie and Rita will creep up and punch you in the face with its pace, tension and sophisticated character development. You have been warned! What Sheldon has created with Dark Waters is a ripping journey of moral ambiguity and a very enjoyable read. This review of Dark Waters first appeared in Crime Factory 18 in March 2016.